Our Earth is a unique planet in the solar system, and also in the known universe because it supports life. Life on the Earth has been evolving since 3.5 billion years ago. Because our Earth has got every ingredient for the life to emerge. Our Earth is not a solid piece of rock, like an iron ball. But instead, it is made up of several layers. Each layer has its own physical and chemical properties. Each layer plays an important to make the Earth look like as we know it today. 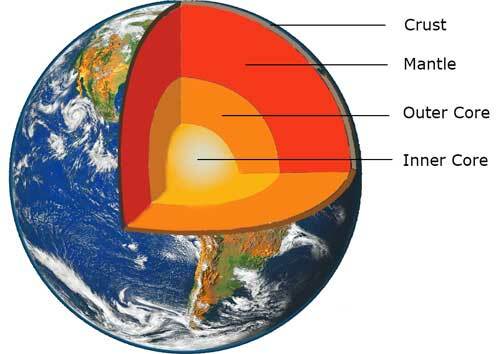 Our Earth is divided into four main layers. Each layer with its own unique physical properties. 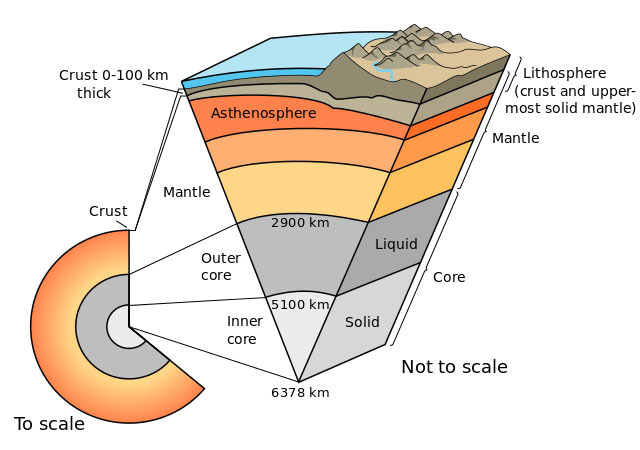 These layers are Crust, Mantle, Outer core, and Inner core. Let’s dig into these layers and find out what they are made of. This is the layers on which you stand on. All the mountain, jungles and oceans you know are carried on this layer. It is the thinnest layer of the four layers. This layer is 70 Km thick on the land, and 5 Km thick at some ocean floors. The crust is mostly composed of silica, alumina, lime, magnesia, and iron oxide (rust). This layer starts below the crust layer, and is denser than the crust. It is 3,000 Km in thickness. It is mostly made of silicate rocks rich in magnesium and iron. This layer is not a perfectly solid. At some locations, the rock is completely melted, which is called magma. When this magma reaches near the crust, it erupts as Lava from the volcanoes. In this layer, rocks are in constant motion. They rise and sink due to internal heat from the core, and set up the convective currents. These convective currents also cause the tectonic plates to move and crash into each other causing earthquakes. This layer of the Earth is in a liquid state at a temperature of 5000 C. This layer is mostly made of iron and nickel. Both of these two metal are in a liquid state due to intense heat. The outer core is always in constant circulatory motion, which creates a magnetic field around the Earth. This magnetic field protects our Earth from the Sun’s deadly wind. Without this layers, our Earth couldn’t have a magnetic field. Without this magnetic field, our Earth could never have atmosphere, oceans, and life. This is the hottest layer of the Earth, reaching a temperature of 7000 C; much hotter than the surface of the Sun. It is also composed of iron and nickel metal. But, this layer is in the solid state. Despite the fact that, it is the hottest part of the Earth. This is because the inner core is under tremendous pressure due to the weight of the other layers. Earth is the only planet, where life is found. It is the third planet from the Sun. It has only one moon, called Luna. Abdul Wahab, "Composition of the Earth," in Science4Fun, April 13, 2019, http://science4fun.info/composition-of-the-earth/. Composition of Earth is so wonderfully presented that I can not resist saying Kudos.